Commercial grade components include two independent straps indexed for fast even adjustments, Exclusive carabiner anchoring strap. The process will continue to burn calories and build muscle. Anchor using doorways, pull up bars, rafters, beams, outdoor park structures - even tree limbs. The webbing has a door stop ring made of foam that will not damage you door. The does not require any screws and drills. It can be exercised directly with a single fixed point. Full Body Resistance Trainers feature indexed straps and quick adjust buckles so you can tailor resistance for each exercise. Complete full sets of every exercise by dialing in the amount of resistance that works for you - even with pull ups. Results pile on fast when every workout is custom tailored to maximize your challenge. Rubber grips can be rinsed with water and dried after each intense workout. Unlike foam grips, rubber grips are much more sanitary in use with hands and foot cradle exercises. All metal parts are corrosion resistant and great for indoor and outdoor use. Include two independent main straps indexed for fast even adjustments, Exclusive carabiner anchoring strap, Carry pouch.Anchor can use doorways, pull up bars, rafters, beams, outdoor park structures - even tree limbs,Don't miss the quick attach carabiners that let you strap up and go to work in just seconds. 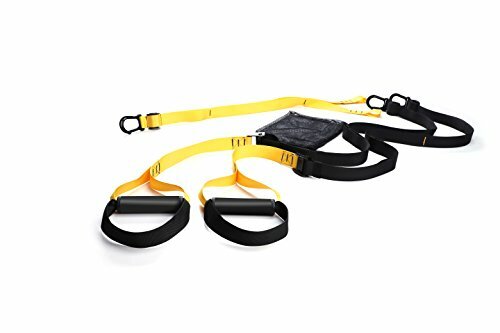 Premium Workout Training Straps the Fitness Bodyweight Resistance Trainer lets you use your bodyweight with the natural force of gravity. You get exceptional workout for a much stronger core, Increases endurance and improves flexibility to keep you strong and young. Risk free 60 day money back guarantee ensures this will quickly become your favorite no-risk purchase. Also wonderful for friends, family, and co-workers - anyone who likes a great complete body workout. If you have any questions about this product by Sea area sports, contact us by completing and submitting the form below. If you are looking for a specif part number, please include it with your message.